Ham hock is one of those little-used cuts in Ireland. Used so seldom that I normally have to request that the butcher keeps some for me and I rarely, if ever, see it on a supermarket shelf. I don’t know what it is but it seems that any cut of meat that involves a bone or messy work people seem to shy away from cooking. There really is no need to be so worried about cooking any kind of meat on the bone so long as you have done your research right, anyway cuts of meat on the bone lend themselves to long, slow cooking to make the most of the flavour. Mam rang me last week to tell me that the local butcher had 3 ham hocks for €3 on sale on their shelves. She picked up one for me and set me the challenge of doing something different with it. Normally I’d cook the ham hock in a big pot of water for a few hours, then pick it over and use the water and ham to make a warming soup with lentils, fresh vegetables and herbs. It’s very nourishing and I will blog it again I’m sure. This time around though I was inspired in part by a terrine that I saw Raymond Blanc make a while back which was full of spring vegetables. The result is a bright, sweetie coloured ham hock terrine which is perfect for a light lunch or a starter for a cutprice dinner party. You’ll need 2 ham hocks for this recipe, I only had the one but made do all the same. 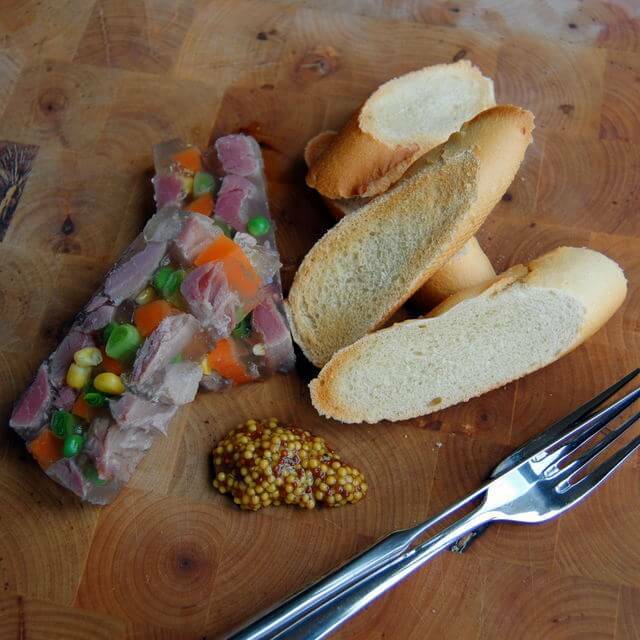 The terrine will easily serve 6 adults as a starter or lunch. You do need to start to prepare 2 days in advance but there isn’t much work in it, it’s just that it takes time to cool and chill the various components. Once assembled,covered well and set the terrine will keep for up to 3 days in the fridge. Place the hamhocks into a large pot with the peppercorns, thyme, bay leaf and onion studded with cloves. Cover with water, place the lid on top, put on the hob and bring to a slow simmer. Simmer for 4 hours, remembering to check the water levels every now and again. After 4 hours turn the hob off and leave the hocks to cool in the cooking liquid. It’s best to leave to cool overnight. The following morning skim any fat off the top of the liquid and bin it before you remove the hocks from the liquid. Start to heat the liquid again on a slow, low heat. Peel the carrot and slice lengthways into thin batons. Try if you can to trim them to the length of your loaf tin. Trim the baby leeks/spring onions in the same way. Fill a large mixing bowl with ice cold water. Plunge the carrots and leeks into the now hot cooking liquid for 3 minutes to cook through then remove them and put them into the bowl of cold water. Line your loaf tin with cling film, making sure there are no gaps. Using your fingers and knife remove all the meat from the ham hock bones, making sure to trim off any excess sinew or fat that is left. You should have chunks of meat falling away in your hands. Remove your now chilled vegetables from the bowl of cold water, put them to the side of your chopping board and empty it. Decant 300ml of the hot liquid carefully from the pot to the large bowl. Turn the hob off. Fill the small bowl with cold water and place the 2 sheets of leaf gelatine inside to soak. Layer the bottom of the loaf tin with half the chunks of meat leaving no gaps. Next sprinkle half each of the sweetcorn and peas on top. Alternate the carrots and spring onions/baby leeks on top of this. Sprinkle the rest of the sweetcorn and peas over. Now layer the top of the mixture with the rest of the ham hock meat. Cover the top of the terrine with cling film, leaving a small section free at one corner. Place a large clean tin or weight on top, making sure the small section is still free. Take the leaf gelatine and squeeze it to remove any excess water then stir into the hot liquid in the larger bowl until dissolved. Carefully pour the liquid into the loaf tin until it starts to reach the top of the meat. Seal the rest of the gap with more cling film. Recipe sounds delicious and I have some ham hocks coming my way in the next couple of weeks…. guess what I’ll be doing with them! Oh great Margaret. I hope you enjoy.